Once you've built your form or survey, you want to collect responses. You don't want to worry about where and how your respondents fill out your form or survey. Some might use their PC or Mac, others their iPad and others their iPhone or Android smartphone. With SurveyTalent, your forms and surveys will look great on any device. Use an easy-to-remember link to collect responses on the web, on Facebook, on Twitter, on your weblog, or through email. 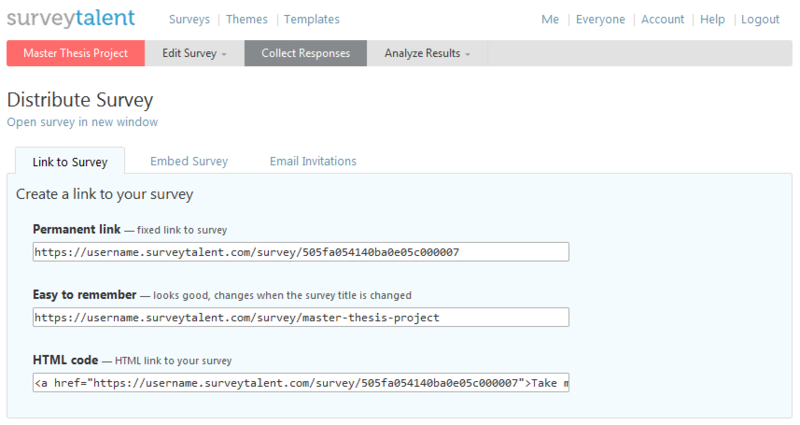 You could also embed your form or survey directly into your website. This means respondents won't have to surf to another site to fill out your form or survey. Use the response manager to view individual responses afterwards. This is also where you can manually add responses, for example if you're also collecting responses on paper.